Potato, Onion Packets with Gruyère, Thyme for Cooking easy sides. A summer version of Potatoes Savoyard. It's cooked on the barbecue grill, wrapped in foil. Use sweet onions if you can get them, otherwise regular yellow onions are fine. Dried herbs work best in this, use any you like. 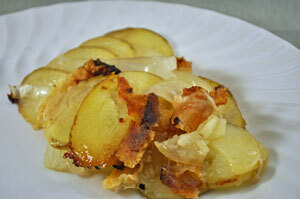 Thinly slice potatoes, onions (cut in half first) and cheese - about 1/16 inch. Lightly oil 2 square (as long as the package is wide) sheets of aluminum foil. Place 2 slices of potato side by side, place an onion slice halfway on the potatoes in the middle and 1 slice of cheese on the onion slice. Overlap 2 more potato slices, onion and cheese - repeating until you have used 1 potato and half the onion and cheese - or until you think you have enough. You should end up with 2 rows of vegetables - 2 potato slices wide and about 5 inches long. Sprinkle rosemary over the top. 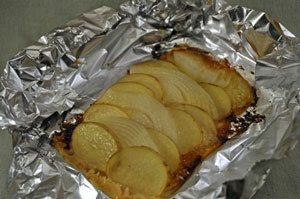 Fold foil over, the 2 long sides first then the short (don't worry about a tight wrap - we want steam to escape). Repeat with the other potato. Cook packets on barbecue grill for 25 - 30 minutes. Do NOT turn over. When done, potatoes and onions should be cooked through and the cheese will have melted and formed a golden crust under the potatoes. To serve carefully slip spatula under cheese - trying not to tear the foil and to maintain the shape of the potato/onion packet. Lay on plates and enjoy! Note: Can be baked at 400F for 30 minutes - just put packets on rack in middle of oven... you won't get the nice, crispy cheese, though..